I can’t wait to share what adventures I’ve been up to lately! But my computer is in the repair shop, so until I get it back and can share the photos I took, here are a few things that can take up your reading time. Packing for a Bus Trip? This is my second time being published on Travel Fashion Girl. I wrote a packing list for long-distance bus travel. 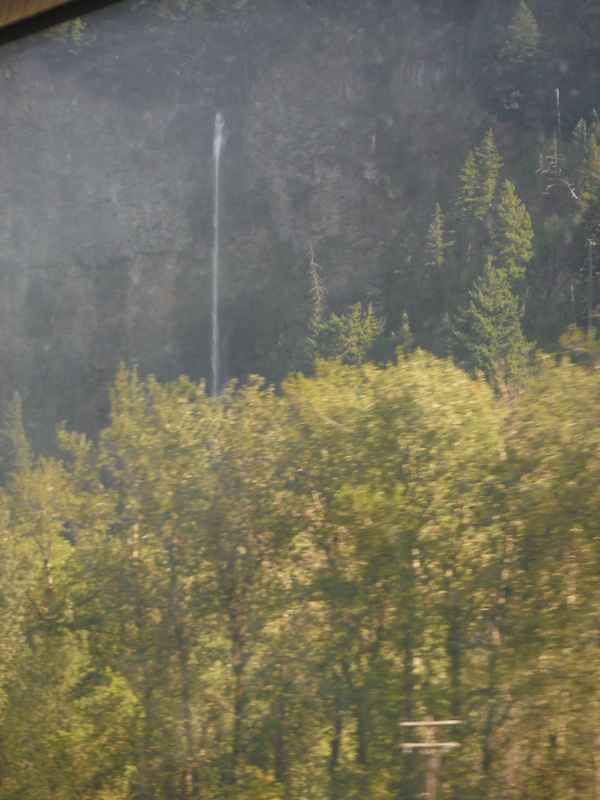 It seems like lately I’ve been writing a lot about long-distance bus travel. The last time I rode a bus was in August, going from Barcelona to Nice. (Well, I guess I rode Istanbul’s city bus in October, and while it seemed like it took forever to get across that city, I’m talking about true long-distance bus travel!) 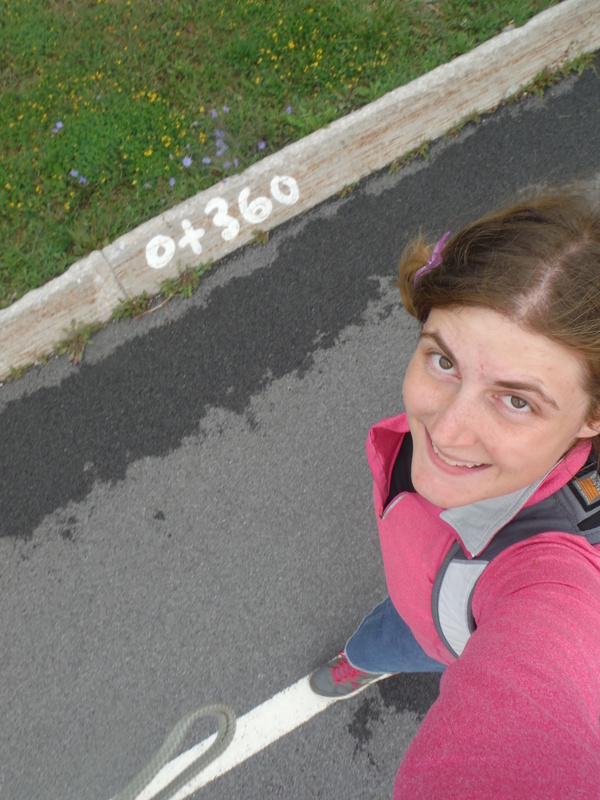 But between July 2014 and August 2015, I rode the bus a bunch! 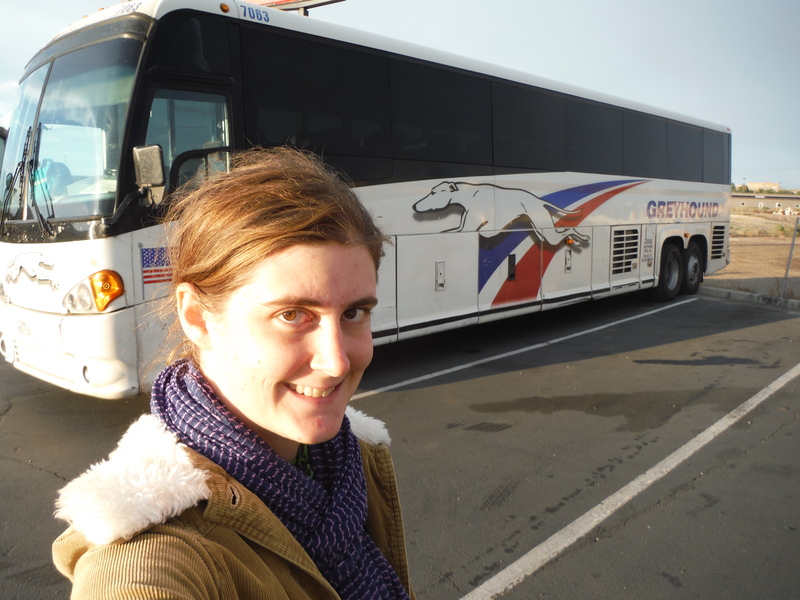 I took a bus trip to Niagara Falls, rode the Greyhound across America, and used Eurolines bus service instead of Eurail for my first month in Europe. This is me in Italy, but I’m not an Italian girl. I actually wrote three articles for the April/May issue of Pristeen Magazine. While it’s a fashion-based magazine, I got to write more about adventure-based things. My first article on page 10 is “Who in the World is Fanny Crosby” a historical figure I look up to. But the really exciting stuff starts on page 56. I wrote about my experience in Italy for the “Around the World” column. 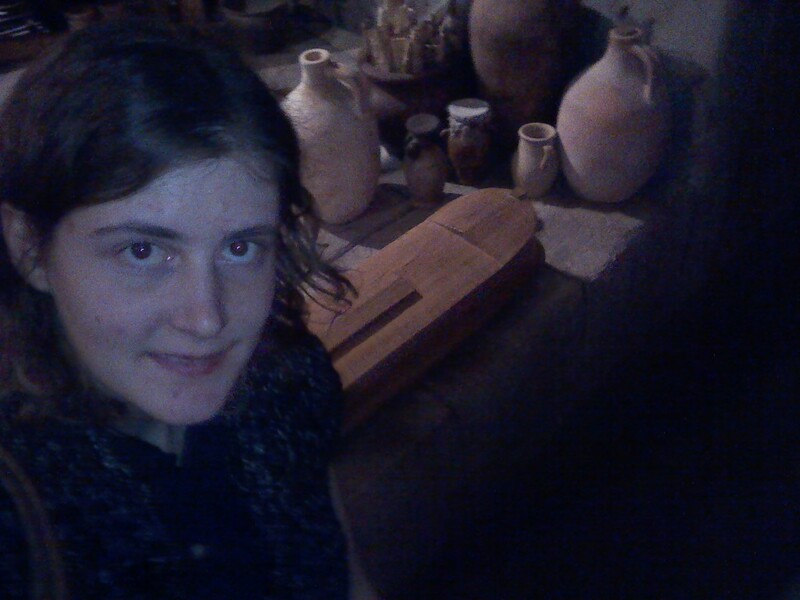 Then I interviewed Osayi, a 17-year-old from Rome. Although I haven’t personally met Osayi, it’s possible that we were in the same church service once! I got connected to her by e-mailing a pastor at an English-speaking church I attended in Rome. You can read all about Osayi, Rome, and all of Italy by reading Pristeen for free here! Travel the World, Then Change the World! I took a day away from my Niagara Falls trip to serve at an inner-city ministry. I don’t always write about travel. But I do believe that travel is one way to help better understand the world, and therefore know how to change it. Some of these principles are applied in each and every issue of Girlz 4 Christ Magazine, which you can subscribe to for FREE! 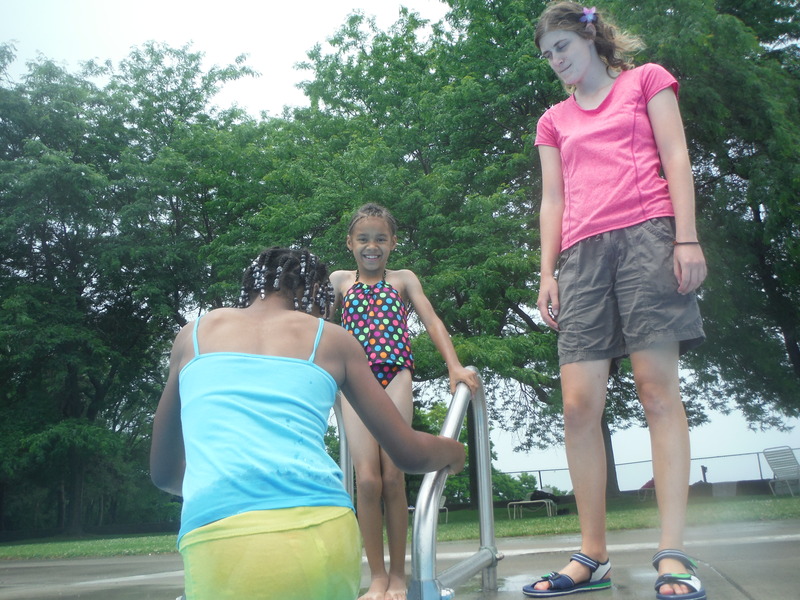 As Girlz 4 Christ’s editor, I love submissions from how people are impacting their communities. In the past issue, I got to write an interview with actress Cozi Zuehlsdorff, a documentary review and interview with an adopting family, suggestions for those times you have to stay put but want to take a “bookation”, and a collaboration of five previous cover girls to celebrate the magazine’s fifth birthday. I’m working on the next issue which will feature a famous Christian on the cover, and even include some adventurous articles inside! I’m six foot one. And I’m a traveler. These two things don’t typically work hand-in-hand. Wouldn’t it be great if tall people could travel without running into any height-related problems. Wouldn’t it be great if travel-related companies could expand their reach by better catering to the tall population? If so, take note! Here are six things I can’t stand as a tall traveler, as well as ways I try to deal and simple ways the travel industry could help. 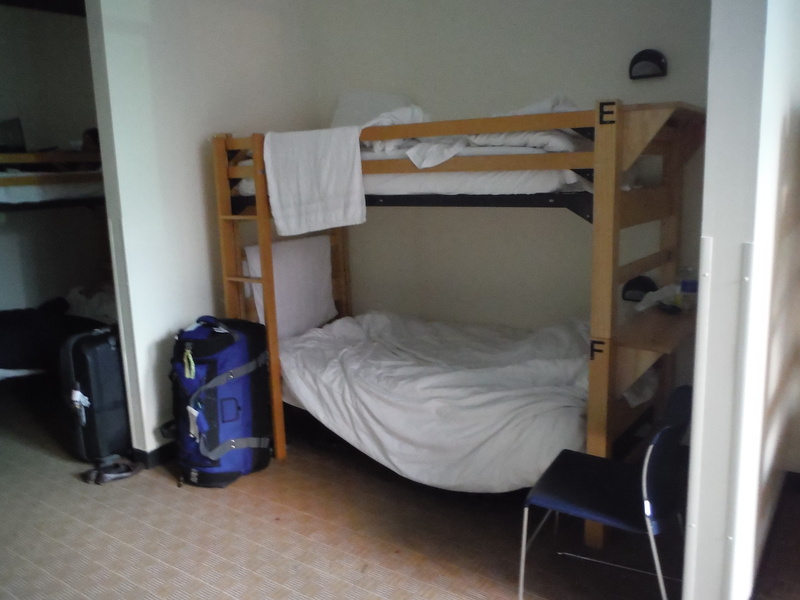 HI-Chicago dorms featured the best of both worlds: partial walls around the beds for more privacy, but tall bunks, high ceilings, and an extra foot of room between the bed and wall to accommodate tall people. I Can’t Fit in Twin Bunks! Actually, the only beds that are truly long enough for me are XL twins and California kings. Since I have never owned either of these types of mattresses, I have gotten used to curling up in order to sleep. But there are definitely times when I toss and turn and just want to stretch out in bed. There are two things that REALLY help in this case. One, having plenty of space above me. It seems like when I’m on a bottom bunk, the top bunk is only two feet above my head. If I’m put in a top bunk, the ceiling is only two feet above my head. I really appreciate dorm rooms that take things like sitting up in bed into account by ensuring that the ceiling is high enough and using beds with ample headroom. The other thing that really helps is not having any sort of blockade at the end of the bed. If I need to stretch out my legs, I’m okay with my feet hanging off the edge. What I’m NOT okay with is if there is a wall on both sides of the bed. I slept in an RV for a month where the length of my bedroom was exactly one inch shorter than I was. Even though I still had a twin bed when moving into my next place, the freedom to hang my ankles over the end of the bed made all the difference. If hostels offered XL twin mattresses, I would be willing to pay a little extra for that luxury. Having to share your bus seat with your carry-on items can make a cramped ride feel even more squished. I Can’t Fit in Coach Seats! I’m not sure how I’ve made it through every flight I’ve ever been on. I guess that’s why I only fly when it’s the only reasonable option. I got a tip from another tall person before to request an aisle seat so that you can stretch out your legs in the center aisle of the plane. I do this whenever I’m going somewhere without a view (otherwise being cramped in a window seat might be worth it), but there is the drawback of people walking down the aisle who step on your feet and flight attendants ramming into your legs with the beverage cart. When boarding buses, I hope and pray that it will be empty enough that I can get two seats to myself, and therefore sit kind of sideways. I’ve never had a plane ticket where I was able to choose the economy plus seats with extra leg room (or even an emergency exit row), but if buses offered the option of paying extra for more leg room, I would definitely take that into account. Trains of course are a problem as well, but on one leg of an Amtrak ride, the woman sitting next to me got us switched from seats in the middle of the car to seats in the front of the car. Not having a seat in front of me did provide a little extra leg room, and there was even a bar sticking out of the ground so we could still put our feet up. However, the train probably bothers me the least since you can always go to the observation or dining cars. Gorge View Hostel made an excellent use of space in a small bathroom. The shower had a tub basin and a curtain instead of a door for ample movement, there was nothing in the way of the toilet’s leg room, the towel rack is placed in reach but not in the way, and as for the sink- just look at that wonderful mirror! I Can’t Wash My Hair! I can only think of one time in my travels that I thought the shower heads were at the perfect height so I would have no problem washing my hair. Oddly enough, that was in Peru, when I was at least a foot taller than most of the locals. Most of the time, the stream from the shower head doesn’t even get on my face. In the tub showers, I can usually back up and then bow my head so my hair will get wet. But this seems to be more of a luxury, as many showers in hostels and camps are boxed stalls where there’s hardly enough room to turn around, let alone squat low enough to get water on my head. This isn’t as big of an issue in my own home if my shower head is too low since I install one of those shower heads on a hose. That usually adds enough height, and if for some reason it doesn’t, I can take the shower head off the wall and adjust it to where it needs to be. I’m guessing accommodations wouldn’t want me to do even basic plumbing on their bathrooms though, but if lodging owners added these shower heads themselves, it would be a small one-time expense to pay for years of happiness from their tall customers. 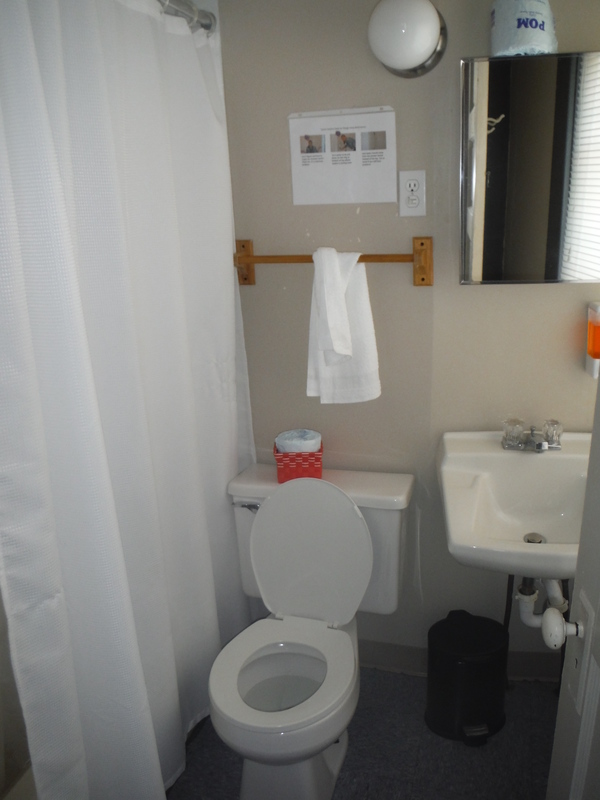 When designing or renovating accommodations, staff should also keep in mind that no one, regardless of height, wants to feel crammed in a bathroom. Allowing more room to move in the shower, by the sink (make sure the mirrors are set high enough! ), and around the toilet (so legs don’t run into the wall or toilet paper holder) is a subtle yet effective way to make guests’ stays much more comfortable. Me with my now-retired carry-on. I’m slightly hunched-down in this picture, and it’s not because my backpack’s heavy. I Can’t Reach All Rolling Suitcase Handles! For years, I used the same little black carry-on rolling suitcase. I usually didn’t have to walk it more than around an airport, so I barely noticed that the extent of the handle was just a bit too short for my arm’s reach. When I started doing more backpack-style trips, this became more noticeable. Last year when I arrived in Niagara Falls, I had to walk just a little over a mile to get from the bus’ drop-off point to my hostel. About halfway there, my back felt so out of whack that I decided it was easier to carry it by hand for the rest of the way. I decided there was no way I was walking it across the border to Canada (I crammed everything I would need for those days in my backpack and begged the hostel owner to store my suitcase until I came back to America). I also decided I should probably buy a new carry-on before going on any more backpacker trips. Last fall, as I was researching suitcases online, I noticed that almost none of them had the specifications for how long the handle extended. I even asked that question on a few of the Amazon purchasing pages. None of the manufacturing companies even bothered to answer that question, and the community answers just said things that were of no help. Seriously, I got a response to the degree of “It’s pretty long. I’m 5’7″ and don’t have to hunch over or anything.” Without exact measurements, it was impossible to tell if someone six inches taller would still consider it “pretty long”. Having important stats like this could really help online luggage sales. I Can’t Fit Into Traveler Clothing! This might be more of a “I can’t fit into ANY clothing” complaint, but at least with my day-to-day street clothing, there are enough stores and brands so I can shop around until I find the right fit. With fewer companies specializing in women’s travel clothes, I haven’t found any article that fits and flatters me just right. Many outdoor stores only carry up to women’s size 10 (US) in shoes and sandals, leaving me with the option to either risk ordering online or instead going with the clunky men’s shoes. I’ve had to go to plenty of water-based events where one-piece swimsuits were required. Since I have never found a one-piece that would fit me, this means I bulk up my bag with at least three different pieces of swimwear so that I would be modest enough. (My tummy shows even with tankinis.) Pants are too short, long enough shirts are too baggy… you get the picture. It can take hours of determined shopping to find even one piece that will sort-of work. I know there are high-fashion clothing lines designed for tall women, and all styles of clothing for tall men. I wish someone in the clothing industry would figure out that tall women like to travel, too. 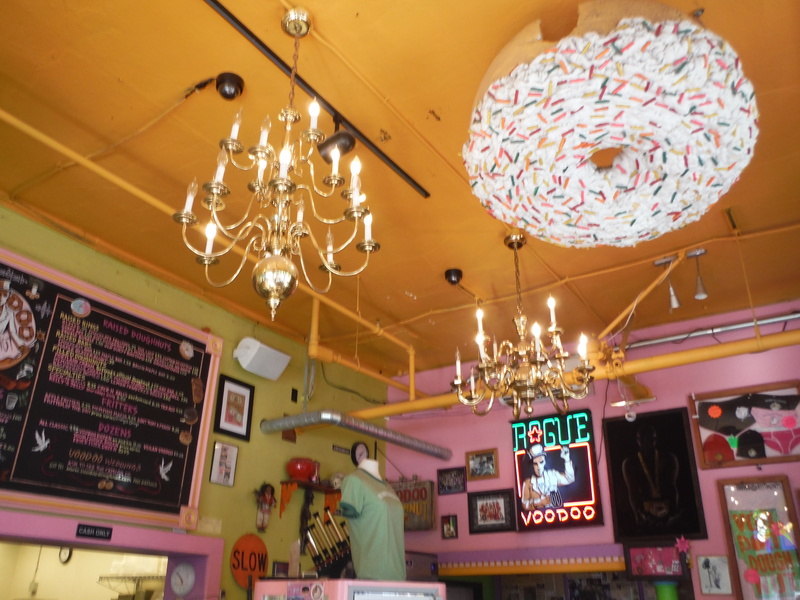 The good news is Voodoo Doughnuts has some pretty cool chandeliers to look at that are far enough out of reach to avoid damaging them (and people’s heads)! The bad news: you’ll have to look at them and the other tall-people-friendly decorations for a long time since the line is always long! I Can’t Avoid Hitting My Head on Things Suspended from the Ceiling! Yes, the dining room looks beautifully decorated with a glass chandelier. But it’s bad room feng shui to place it high enough to be out of my line of vision, but not so high that I won’t run into it with my forehead. And the antique doorway that hasn’t changed in 200 years? You must realize that the average person was much, much shorter back then. I don’t even know where to start when it comes to those tiny prop planes. Decorators and designers need to keep in mind that they are probably not the tallest people that will be in that area. For things that can’t be moved or removed, a warning, both in the planning guide and in person, would be appropriate. Someone yelling “Be careful! Watch out!” right before the incident (or worse yet, right after) is not responsible. I’m actually surprised I have never heard about a lawsuit over something like this. For now, I guess the best solution is to make sure I get plenty of calcium so that my cranium is strong enough to protect my brain from all these impacts. The travel industry has found ways to better serve overweight people, short people, and handicapped people. Isn’t it about time that travel becomes inclusive to tall people, too? Featured Interview on Something In Her Ramblings! 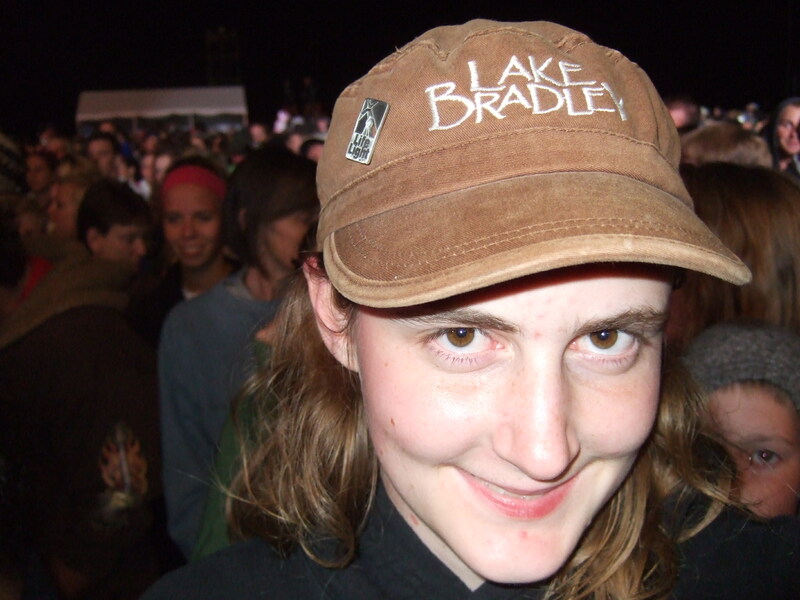 If you head over to Something In Her Ramblings, you might see a familiar face in today’s guest interview. 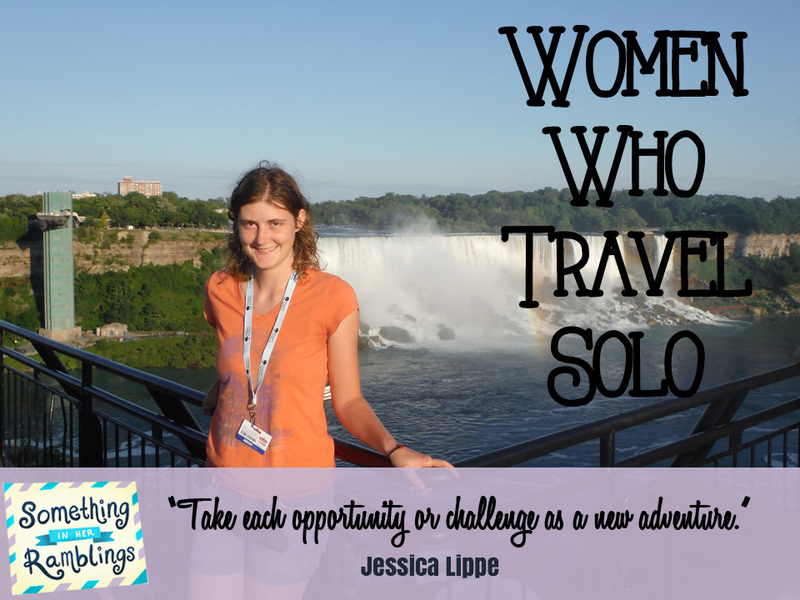 Each week, that blog features a different female traveler in the “Women Who Travel Solo” series. 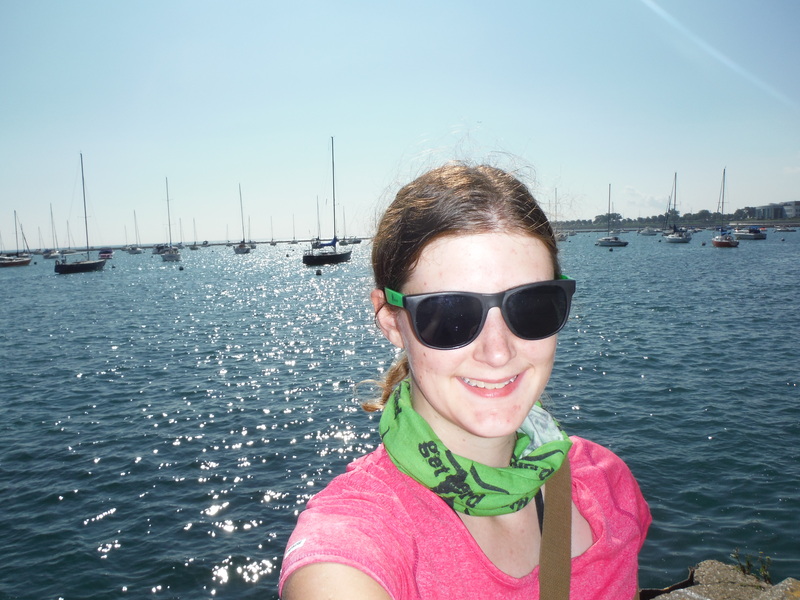 I was asked about last summer’s trip to Niagara Falls, and about solo travel for women in general. I even provided some tips there that I haven’t mentioned on this site yet! After entertaining ideas in my head for the past year or so, I finally confirmed that I will be trekking through the Mediterranean. This was decided on exactly two months before my departure date. So what can I do in those waiting months? Ha, there’s plenty to do! Here’s a checklist if you want to know what’s been on my mind lately, or if you’re interested in taking on a similar endeavor! Buy plane tickets. I have found fairly cheap tickets with budget airlines, but in the end, I just booked with Expedia. There were a few reasons for this: for one, I could make sure to earn loyalty points, both with Expedia and with the name-brand airlines they booked for me. For another, I could fly right out of the nearby little airport instead of going to Portland, San Francisco, or another major airport. It would also ensure that there would be no ridiculous hidden fees and that all the basics were covered. I know the exact size my luggage can be, whether or not I’m getting in-flight meals or entertainment, and other things that provide more peace of mind. I decided to book shortly after news broke out about an ordeal involving a passenger suing United Airlines. I thought it might be a good time to snag a cheap ticket. The funny thing was, even though United is usually the cheapest airline for me, that’s not the airline that ended up being the cheapest this time. I guess the other airlines wanted to draw in the loyalties that United was losing! Purchase traveler’s insurance. This was something extra offered as I was checking out with Expedia. I had debated for so long if I would get this, and at the last second I decided to go for it. It was less than $100, but it could end up saving me thousands if certain situations arose. A number of things have the potential to occur during a trip (just like every other day of life), so it’s good to know that I have a fallback for many of these possibilities. Map out destinations. This is especially important if you’re flying multi-destination or open-jaw. You have to be in certain places at certain times, and have to take travel time in between everything. Figure out how many days to spend in each location. Also determine if everything you want to visit is centrally located, or if you’ll need extra transportation or possibly two different accommodations at the same destination. 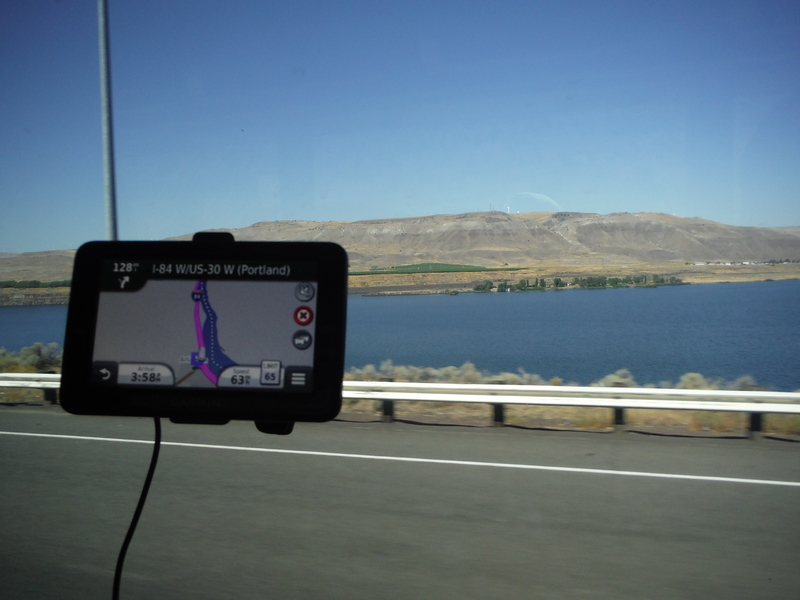 If you’re going to use a GPS, make sure it is loaded with maps of your destination. Make at least a couple of accommodation reservations. My task today was booking the hostel I’ll be staying at for the first several days. It’s a good idea to book ahead of time, since prime accommodations can fill up quickly, especially during busy seasons. I don’t believe in booking all the accommodations for an extended trip though. If your plans change and you want to spend more or less time at a certain destination, it’s nice not to be tied down with having to pay for a bed you don’t want to sleep in. If you are making plans to visit people or enroll in a program, make sure to take care of this ahead of time, though. I was accepted into the Diverbo program a few days ago, which means that I have a free place to stay for seven days (in exchange for speaking English with those enrolled in the program). However, I did have to apply for that ahead of time to make sure I got a place, and I probably should have applied even sooner! Hostels are great! Stay in them as much as you can. Get overseas communication. This was something that I had to promise I would do in order to gain my parents’ support for this journey. WiFi works overseas, but cell phone plans don’t. I did hours of research trying to see if I could get MiFi or an unlocked phone with an international plan, but nothing was cheap, and everything involved waiting until I got overseas for purchasing. However, I finally discovered a company that offers prepaid international SIM cards and inexpensive unlocked phones. I’ll tell you all about them once my phone arrives in the mail! Attend any needed or desired doctor appointments. Your medical insurance probably isn’t valid overseas. And no one wants to have to cancel or shorten a trip due to unexpected health problems, so a pre-trip physical is always a good idea. I’ll usually tell my doctor when I am about to travel, and they often make some good health recommendations that I wouldn’t have thought of myself. Sometimes, they even give me sample-sized products of medicines I may need! Visit the dentist or any other specialty doctors before you go, too. Oh, and if you ever experience any sort of back pain, going to a chiropractor before leaving will change the outlook of the trip. Chiropractors can’t make being stuffed in an economy airplane seat for twenty hours feel comfortable, but they can help make it more bearable. 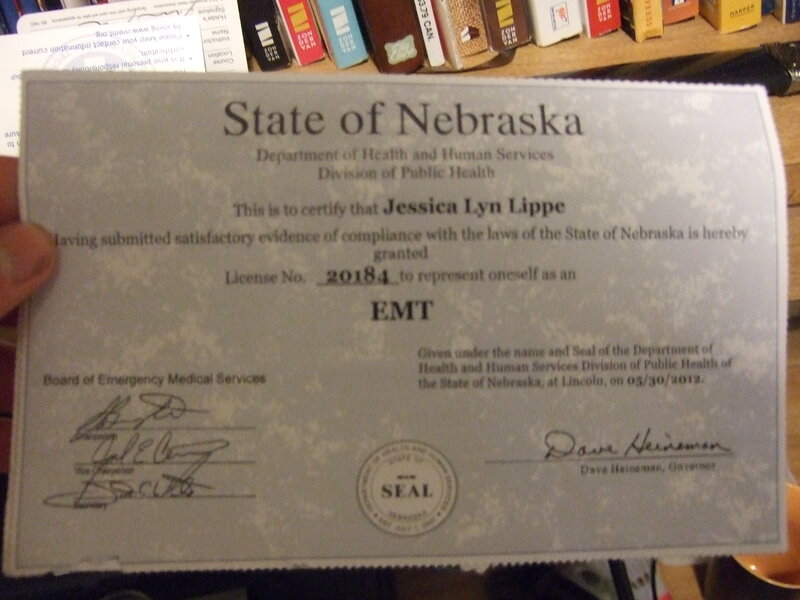 Having been a practicing EMT (and I’m still licensed) gives me the confidence to take care of my and others’ health while traveling. But it’s never wrong to get a second opinion. Arrange things with work. Will you quit? Request a leave of absence? Try to figure out a way to work from the road? Oh, so many options. With three jobs, this one will be an ordeal for me. I still need to modify my writing job so that it will be most effective for travels, and also take care of my other jobs that are not so location-independent. Figure out on-ground transportation. If flying from one airport to another was the only transportation necessary during a trip, travel would be much less stressful. But the thing about airports is they tend to be miles away from the stuff you actually want to visit. Does the destination airport offer shuttle service? How much will that be? If you’re going to multiple destinations, you also have to factor in traveling between cities. Bus, train, or regional jet? Does your preferred method of travel service all the destinations you plan on visiting? Will travel time take up too much of your trip? This is probably my biggest headache right now, but I know it will be so worth it once it’s planned out. Yet another on-ground transportation factor is going about day-to-day. I prefer to walk anywhere possible, but that involves making sure that roads are pedestrian-friendly, allowing extra time to get from place to place, and planning to staying no more than a couple of miles away from the sites I want to see. Gather gear. Knowing I needed a good maximum-sized carry-on backpack for this trip, I found one way back in December. It’s possible that will be my biggest piece of gear, but there are plenty of things that I will need for this trip that I don’t normally have at home. Just yesterday, I bought an international adapter/converter plug (so I don’t fry my electronics), a combination lock (so I can secure my belongings in hostel lockers), and mini caribiners (so I can make sure the zippers on my backpack stay closed). And while I’m almost done with shopping, there are still a few more pieces of gear on my list to get! Ensure passport and any needed visas are prepared. When I was sixteen, there was a big ordeal with getting my passport. I was going to Peru the same year that the law was made requiring passports for Canada and Mexico. With the increase in people applying for passports, somehow mine got lost in a government storage room for months on end, so I had to go to Seattle to get a replacement. Case in point: get your passport as early as possible. Keep in mind that passports technically expire six months before the printed date, so check the information and apply for one if necessary. This will be my first trip where I will need to get a visa. I can actually go through Spain, France, Italy, Greece, and pretty much anywhere else without one, but for just a few days in Istanbul, the Turkish government is going to make me apply for one. This sort of thing can typically be done online ahead of time. Pack. All that stuff you bought for the trip? Now it has to go in the backpack you bought for the trip. I am sticking with carry-on only for a number of reasons: I won’t have to pay airline luggage fees, there’s less chance that I’ll lose anything, I won’t get a back injury from carrying too much luggage, and when I arrive in a city I can explore on foot instead of paying for a cab to get to the hostel. In order to accomplish this, I can’t take my whole closet with me, and I have to siphon liquid toiletries into TSA-friendly 3.1 ounce containers. 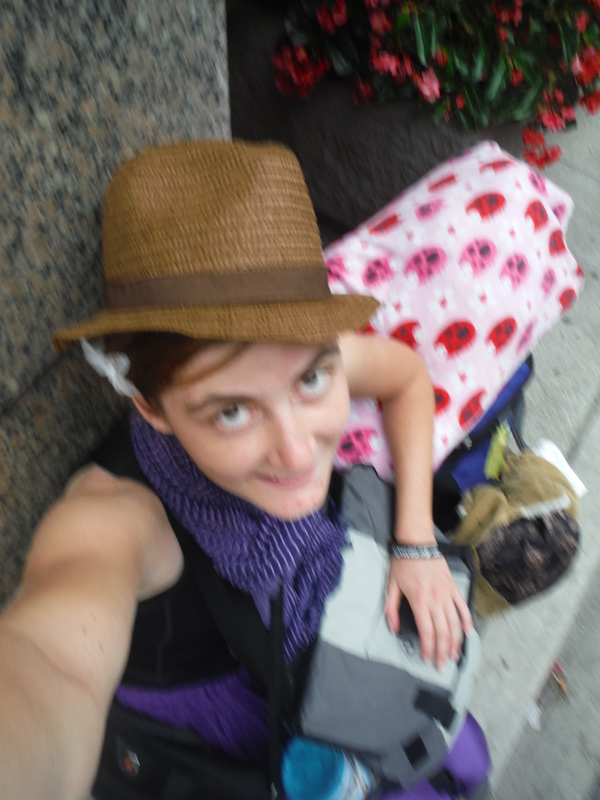 Having multiple bags, like I did while moving across America, means that you may have to try to balance all your belongings on the curb of a busy Chicago street while waiting for a cab to take you one mile to the bus station. Make it to the airport on time! This one is probably the simplest, but also the most important. Find someone to drop you off or otherwise make arrangements, and plan plenty of time to get through the security line and find the right gate. Yes, there is plenty more do to once you land. But for the next few hours, kick back and enjoy the beginning of a new adventure! While traveling, I usually don’t care a whole lot about what my hair looks like. I’m often wearing a hat anyway, or can slip on my Tubie (my Buff knockoff) at any given point. In fact, I don’t think much about my hair at all… until I take a look at my pictures. This was was taken on the Rainbow Bridge in Niagara Falls, right between the United States and Canada. So I had crazy hair in two countries at once! The wind was really strong over the gorge that day, and simply would not allow me to get a good selfie. 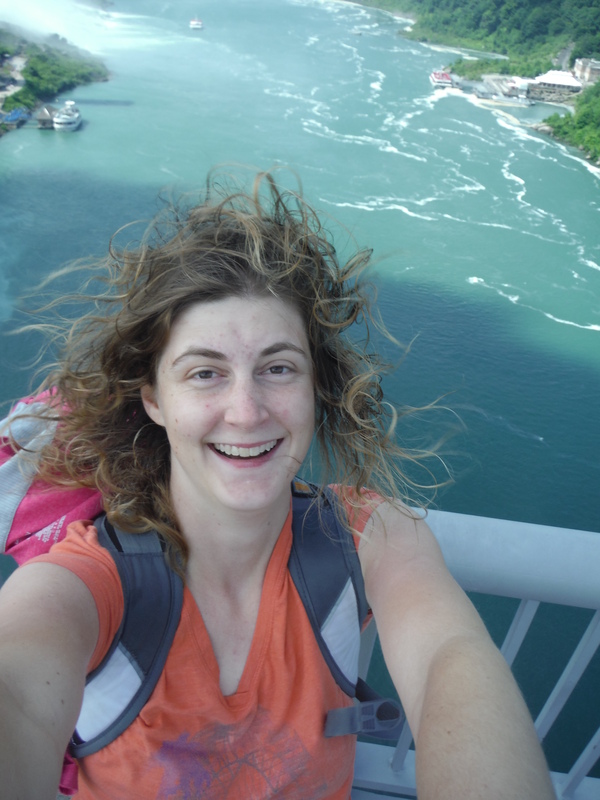 In fact, the wind caused my hair in this photo to be so crazy-looking, I decided to enter it into a contest. I read the newsletter of my favorite author, Melody Carlson, and she has a contest nearly every month. To celebrate the release of her new book about a hairstylist, she had a bad hair day contest. As of now, you can see my picture and story along with several of her other favorites (many of whom were too embarrassed to even include a photo!) by clicking here. When I went to Niagara Falls this past summer, I wanted a good picture of myself with one foot in Canada, one foot in the United States, and the falls in the background. But the wind picked up and my hair just wouldn’t cooperate! But that is certainly not my only travel hair horror story. 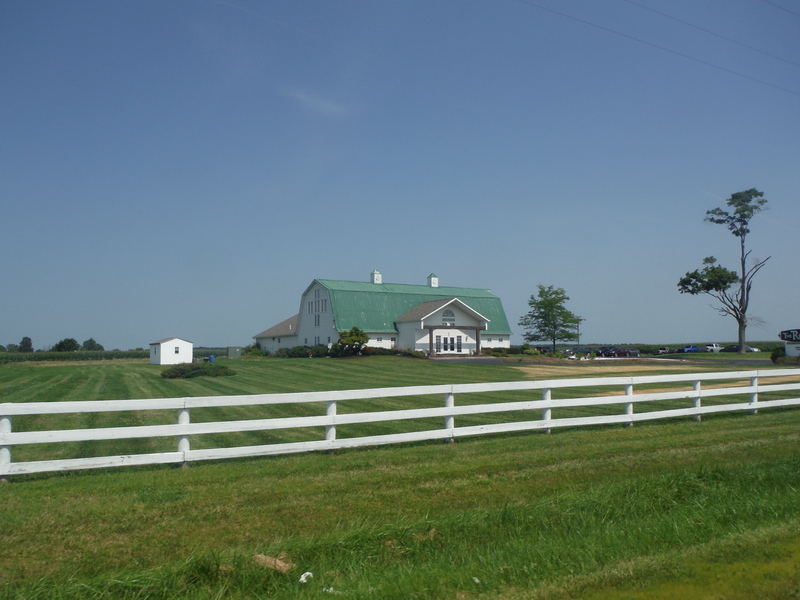 There was the time I was at a drive-thru safari in Amish country. 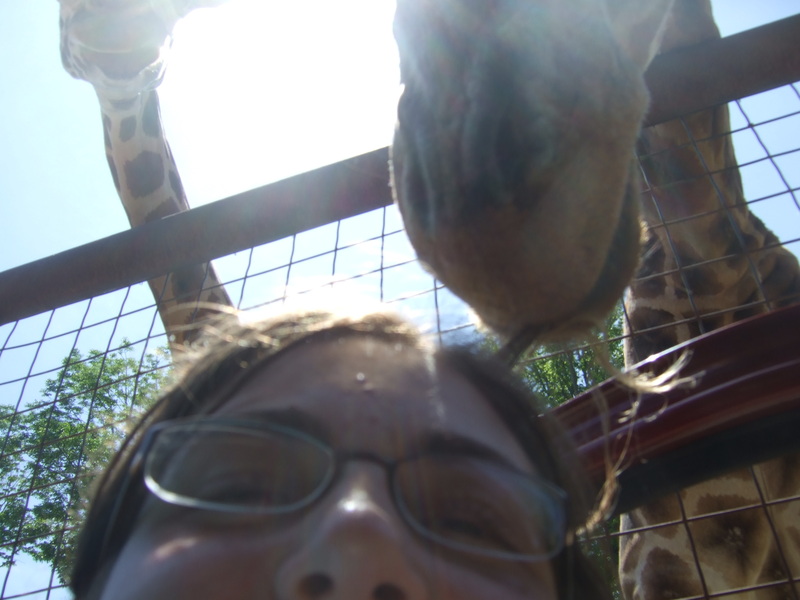 While taking a selfie in front of the giraffes, one of them decided to eat my hair! What’s something funny that has happened to your hair while traveling? 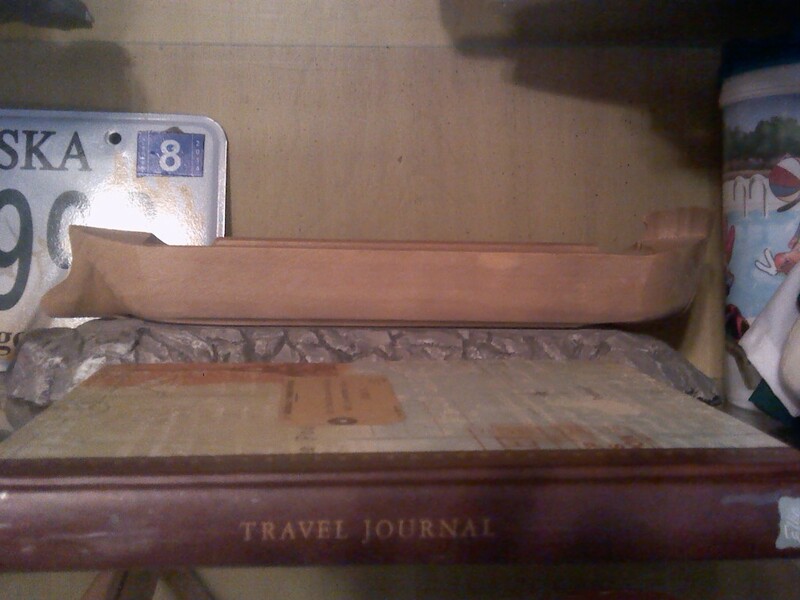 A little over five years ago, my grandmother gave me a travel journal. I had previously kept some sort of documentation for some of my travels. During my first mission trip to Peru, I had brought along one of those cheap spiral-bound school notebooks where I wrote about my thoughts, feelings, and activities of each day. I don’t know where that journal is anymore. When I started my first job by the Pacific Coast, I was diligent to journal for each of my thirty-three days of employment. 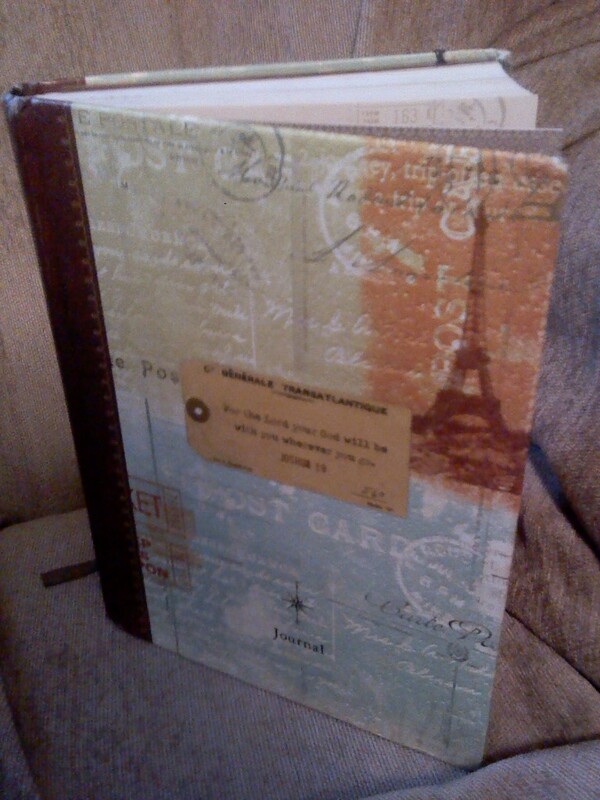 Again, it was a not-so-special spiral-bound journal. I don’t know where that journal is anymore, either. When my tenth-grade class flew to the East Coast, our tour company provided everyone with a colorful booklet with blank lines and writing prompts. I normally would have loved to use something like this, but since we had to turn it in to be graded, I may have been a little snarky and short in what I wrote. I don’t think I even finished filling out that journal, and its possible that it was destroyed after my teacher read it. I really don’t know where that journal is anymore! Even as far back as elementary school, I recall that my second-grade teacher gave us her handmade journals so we could write and draw about our adventures during school holidays, plus anytime we were taken out of school for a vacation (such as my first trip to Disney World). 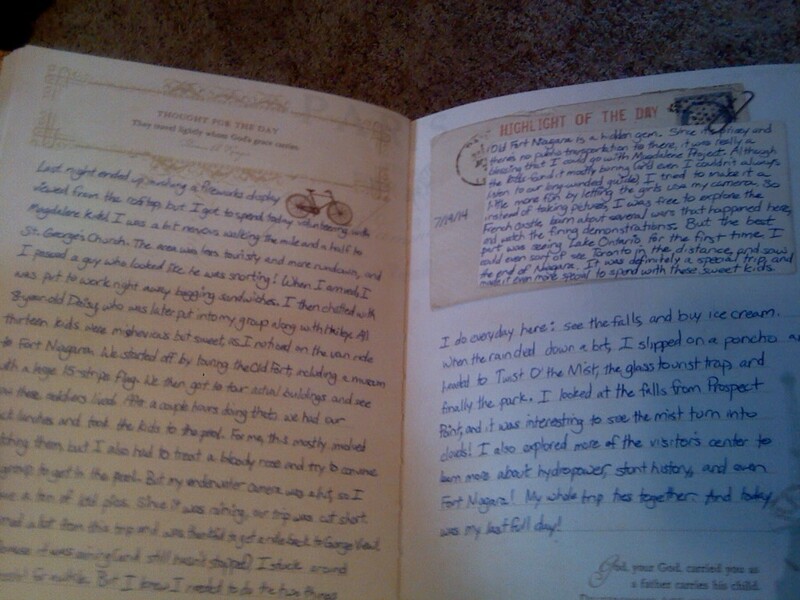 I’m sure my mom has those memories stored somewhere, but I don’t know where that journal is anymore! But when I received this beautiful travel journal, I knew right away that this would be superior to all previous travel journals. I initially used it to record my experience on my 2009 mission trip to Peru. 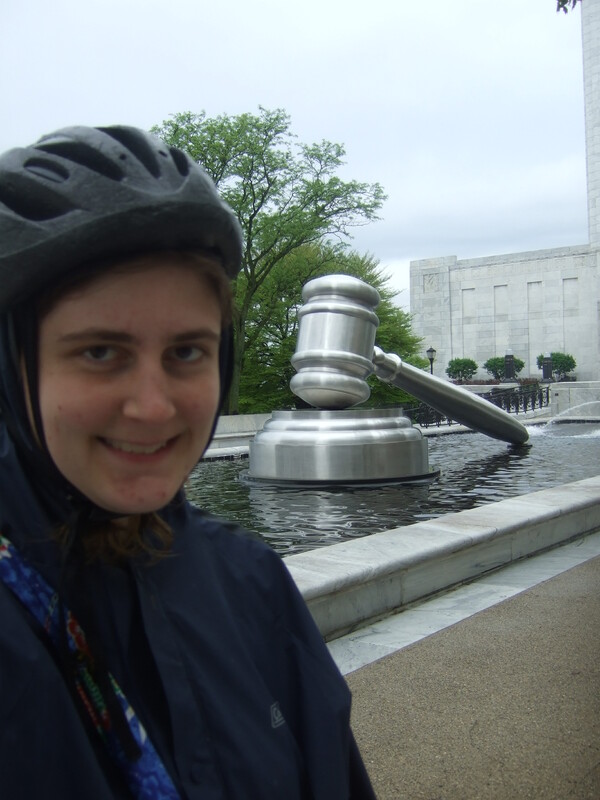 Since then, I’ve taken it along to recount my days on my 2010 Northwest choir tour, my mission trip to Mexico, my backpacker vacation to Tennessee, my international trip to Niagara Falls, and my bus ride across the country. And I know exactly where this journal is. It’s the centerpiece of one of my travel-themed shelves! I don’t write in my journal for every trip I take. For weekend trips and other trips where I try to cram too much in too few days, I believe its a better use of my time to go out and experience as much as I can instead of taking a break to write about it. I also haven’t kept a journal for any trips that are primarily focused on working, such as camp conferences I’ve attended. I don’t think it would be interesting to read my journal years later about how I sat in meetings for most of the day. I memorialized these sorts of trips in different ways, such as photography, videos, or blogging. 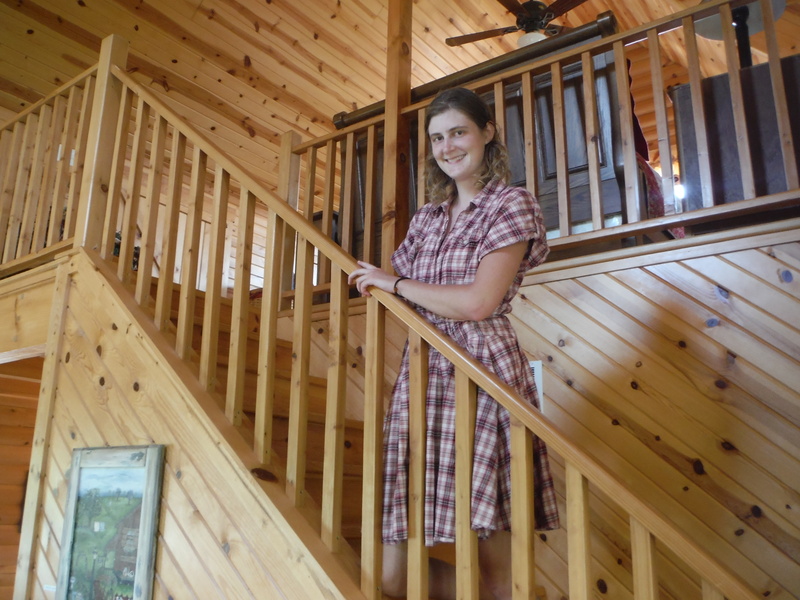 (If you visit The Rivercrester, you can read about almost everything I did while living in Nebraska, from the cool trips that I took to the times I was stuck at camp and only wishing that I could travel!) I don’t really have a criteria for which trips are worthy of my travel journal, but it’s treated like a near-sacred relic, so I use it for the trips that I feel are the most important. This journal has a great layout, including a bookmark, a secure band, and a pocket inside the back cover to hold small mementos. Each page has plenty of room to write, plus an extra box to emphasize my highlight of the day. I also really like that each page has both a travel quote and a travel-themed Bible verse. It’s almost like having a mini-devotional each day of travel. I can usually fit everything worth mentioning about one day on one of these pages, but on some of the more mundane days (like all-day transit or staying at someone’s house), I can fit two days on one page. There have even been days that were so full of events and emotions, it was a challenge to fit everything even on two pages! I had never really considered whether or not my journal was suitable for sharing. It wasn’t until a few months ago when I was journaling in the commons area of a Canadian hostel. A Japanese guy sat down next to me, and attempted to make conversation as a way for him to learn English. When he noticed the book on my lap, he asked if it was a diary. Then, he asked to read it! I handed it to him, and maybe it was because I was pretty sure he wouldn’t understand most of the content, but I felt okay with letting him look at it. After thinking about that ever since starting this website, I decided that I am comfortable sharing the contents of my diary with the internet-connected world. I may change names to protect the innocent or remove pieces that don’t make sense outside the context of my own mind, but I’m willing to be real and unfiltered. So starting next Tuesday, I will have a “Travel Journal Tuesday” where I will post a journal entry every week until I run out. Even though my journal’s only halfway filled right now, I have enough entries to last until at least next summer! Enjoy! Do you keep a journal for any reason? How do you remember your travels? I don’t know when this dream started. Maybe it was sometime in the 60s when hippies fresh out of college wanted to explore the world on a shoestring. But I’m not concerned too deeply about that. I’m wondering when that dream became my dream. I have a lot of dreams. I want to have a family, become a full-time freelance writer and media specialist, and adopt several kiddos. I also have an entire bucket list specifically for travel goals. The one I’m currently working on is the dream of backpacking across Europe. My sister (age five) and I (age nine) in Oahu. Yes, I went to Hawaii with a broken arm. But back then, they had waterproof casts. My family traveled a bit when I was growing up. 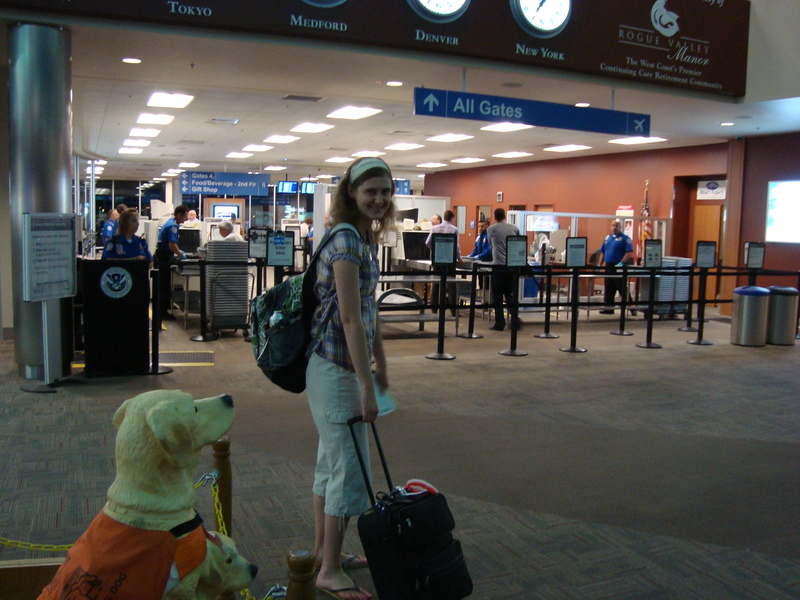 Other than a Mexican cruise, all our trips were domestic: Disney World, Hawaii, Yellowstone… you get the picture. I loved every single trip, but I always wanted to travel internationally, particularly Europe. After all, where else can you see the Eiffel Tower, the Colosseum, Big Ben, and a ton of other notable and historic structures? Okay, maybe in Las Vegas, but Europe is the real deal. Dressing up while working in Bandon, Oregon. I started taking out-of-state trips without my family when I was twelve years old. Mostly this was with my church, such as our X-treme Praise choir tours around the Northwest. Even on the first trip of this sort, I was brainstorming ways we could somehow take our tour through Europe! 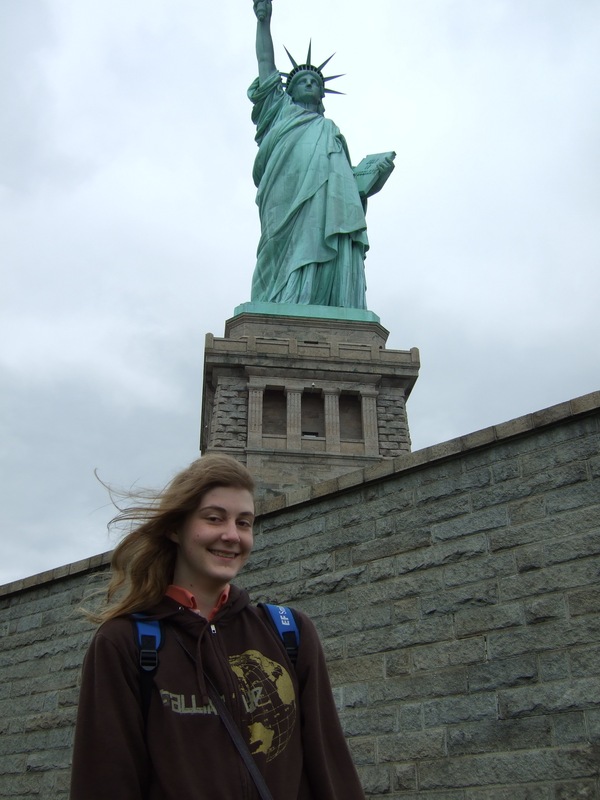 At age sixteen, I went on a school trip to the other end of the country as we touring DC, Philadelphia, and New York. 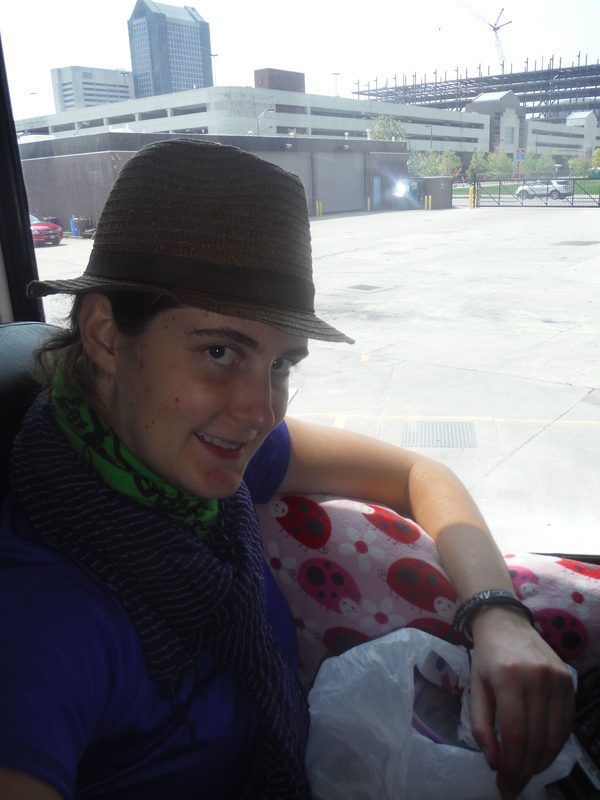 Later that summer, I finally went intercontinental- a mission trip to Peru! 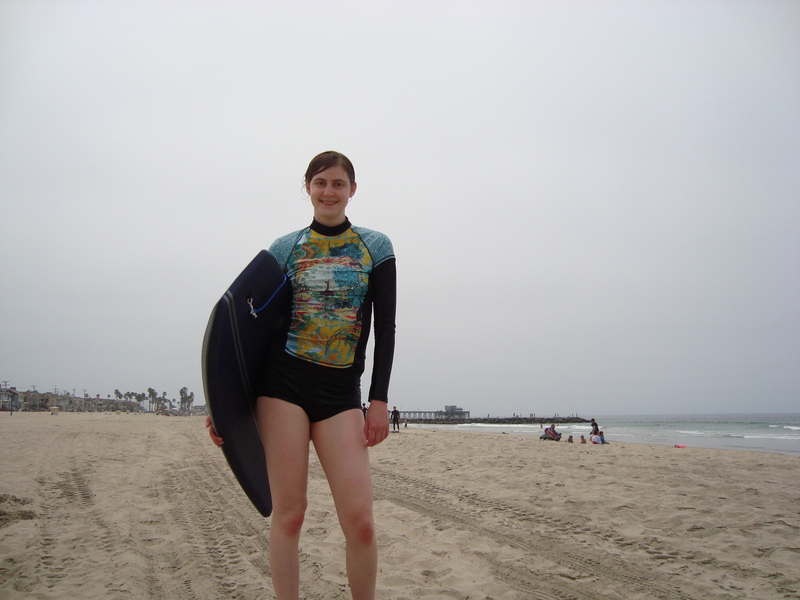 From then until I started college, I spent my summers living by and exploring the Pacific Coast. I went back to Peru when I was eighteen, and one year later, I took a different mission trip to Mexico. 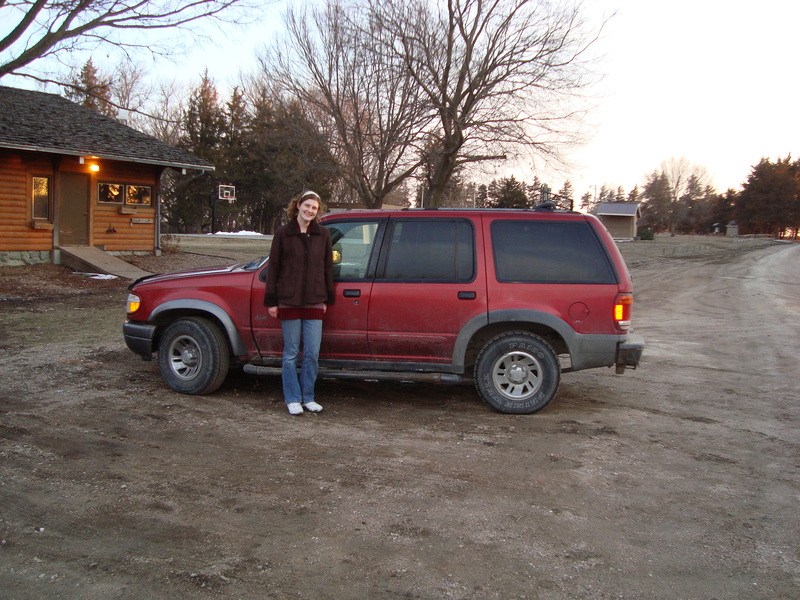 At age twenty, I left my Oregon home and set out for the Midwest. Pointing out where I was on a giant map that I found while backpacking across the city. It wasn’t until I was in college that I learned about hostels, au pairs, and all kinds of low-key travel. 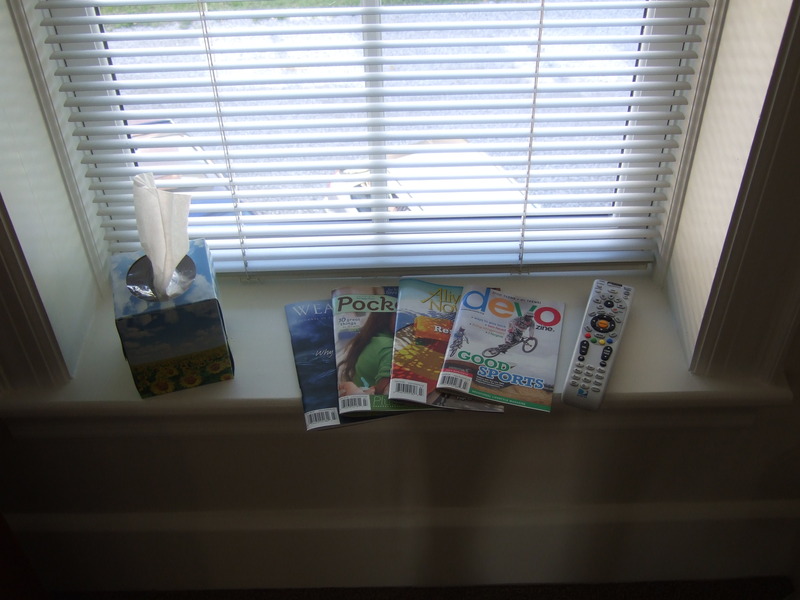 I was anxious to use these new found resources, but things kept on getting in the way. It all turned out for the better, as moving what is normally thought of as flyover country provided tons of opportunities. 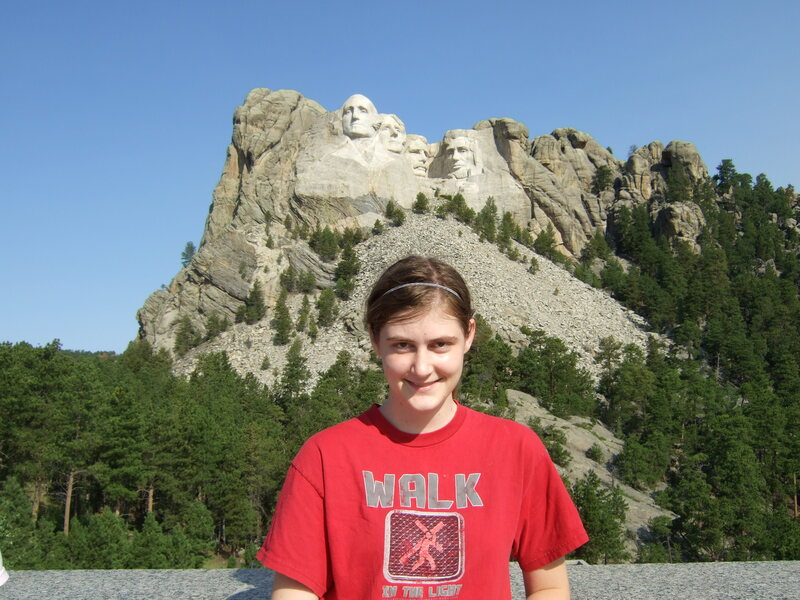 Just three days after moving to Nebraska, I went on a work-funded trip to Mount Rushmore! Work sponsored several other trips, which added several new states to my list of places I’ve been. A year later, I took a trip that would set the pace for all subsequent trips. 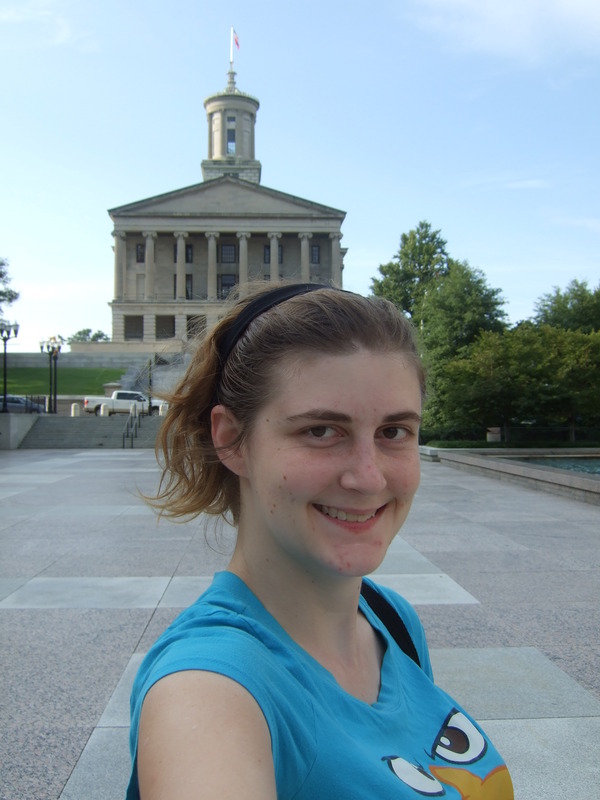 I spent two weeks in Tennessee with just carry-on luggage, my own two feet, and a $0-$50 daily budget. It was my first time staying in a hostel, and I’ve stayed in many since. Even with trips that aren’t officially “cheapskate” trips, I’ve incorporated minimalist packing and being budget savvy. One word to describe my Niagara Falls experience? Exciting! This past summer, I finally crossed borders by myself. Okay, it was only to Canada, and it was only a couple miles from the US border at Niagara Falls. I had recently transitioned from being a general devotional writer to being more of a travel writer. I had already taken a couple partially-sponsored weekend trips for writing purposes, but this was my first big break. Even though I had to work for some comped attractions and lodging, I still had plenty of free time to enjoy this vacation. I stayed on both sides of the border, but while in Canada, I was sitting at a lookout point, admiring all three of the Niagara Falls, and started thinking. Suddenly, I got what I feel was a God-nudge. You are ready to go to Europe. Really? Yes, this was practically a lifelong dream, but I had pushed it out of my mind the last few years as I was doing extensive domestic travel. This was an exciting realization! I decided to leave Ohio right before going on this final trip to Amish Country, so I decided to make the best of it! As soon as I returned from Niagara Falls, I immediately began planning a European backpacking trip. I picked up the AAA Travel Guides, started a Pinterest board, subscribed to a dozen travel blogs, and re-prioritized my spending and saving habits. But there was one thing that still felt wrong, though I couldn’t pinpoint it. I was about to celebrate my first anniversary of living in Ohio, when I quit my job! I quit for personal reasons, but suddenly, my travel goals seemed to become clearer. I would spend a year back at home while saving up and planning for this overseas excursion. This is the end of this blog post, but it’s not the end of this story. I am still in the early planning stages of an international excursion, and I’ll be sure to post my updates and ideas here. It will be interesting to see how this long-term dream finally comes to fruition! Should You Become a Voluntourist? Most of my travels are not simply vacations. On the contrary, I like to use my travel experience as a way to give back to the communities I visit. It all started with a mission trip to Cieneguilla, Peru, back in 2007. 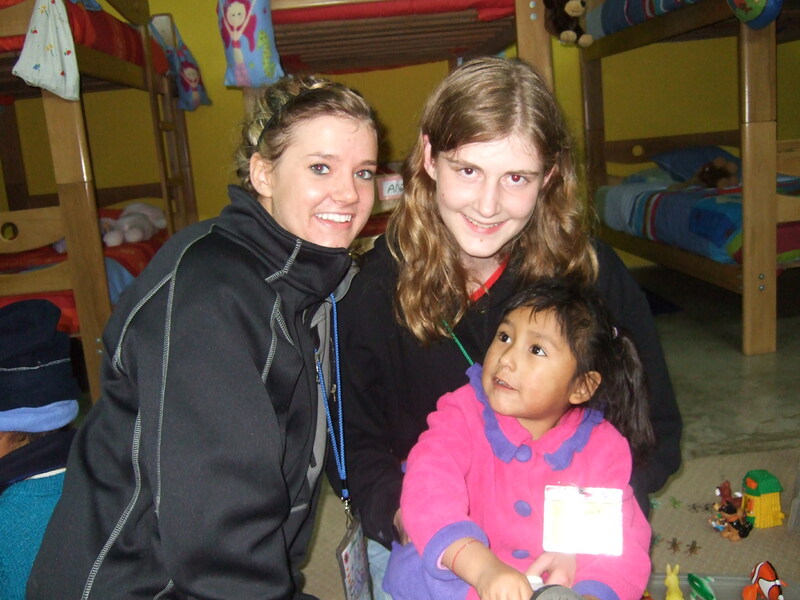 My friend Erika and I with our little Peruvian friend Melissa. My high school youth group went to the Posada de Amor orphanage and their neighboring Eliel Christian School. We did construction and painting projects, taught English, and spent quality time with the children. I had such a great experience, I returned two years later. Playing games with the Rayitos group at Posada. In 2010, I heard about another church that owned a mission in Carmen Serdan, Mexico. They offered trips for people to help out with the handicapped orphans they care for. I went along, and although we didn’t see even one touristy thing, I had a great time! The orphans at the Mexico mission were all ages, such as 41-year-old Lupe. Even though I haven’t gone on another “mission trip” since then, I have incorporated volunteering into elements of my travels. Ever since I was old enough to help, I’ve loved volunteering at camps offered by the Girl Scouts and churches, like this time at Camp Tadmor near Lebanon, Oregon. 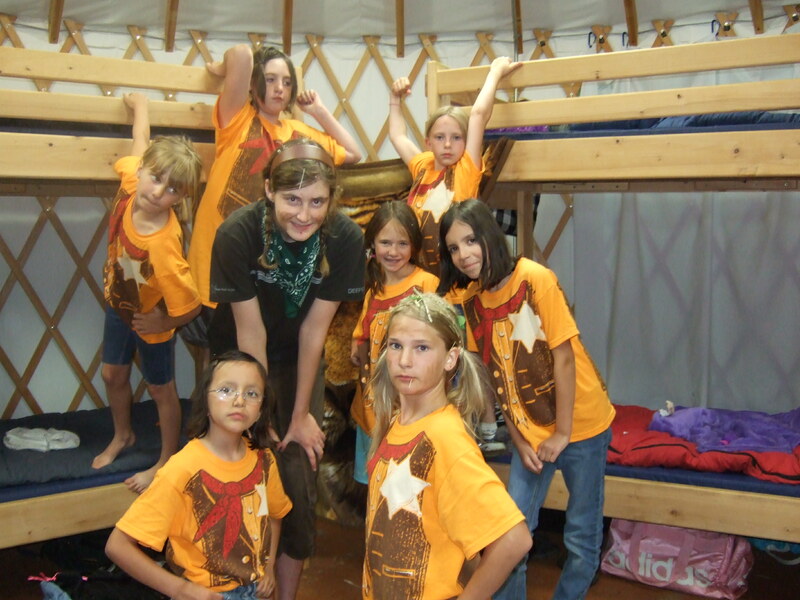 Some of the nine girls in the yurt I was in charge of. When I went to Nashville in 2012, I realized that was the headquarters of a nonprofit magazine that I write for. Before going, I e-mailed the editor asking if we could meet. She responded, saying I was coming during important planning days for the magazine, and I was invited to help with this. I was glad to help out! In the building where we worked on Devozine. This past summer in Niagara Falls, I learned about a ministry called the Magdalene Project, which helps homeless people, prostitutes, and low-income families. I called up the director and asked how I could help. After asking me about my skills and passions, she offered to let me help chaperone a trip with their kids’ club. 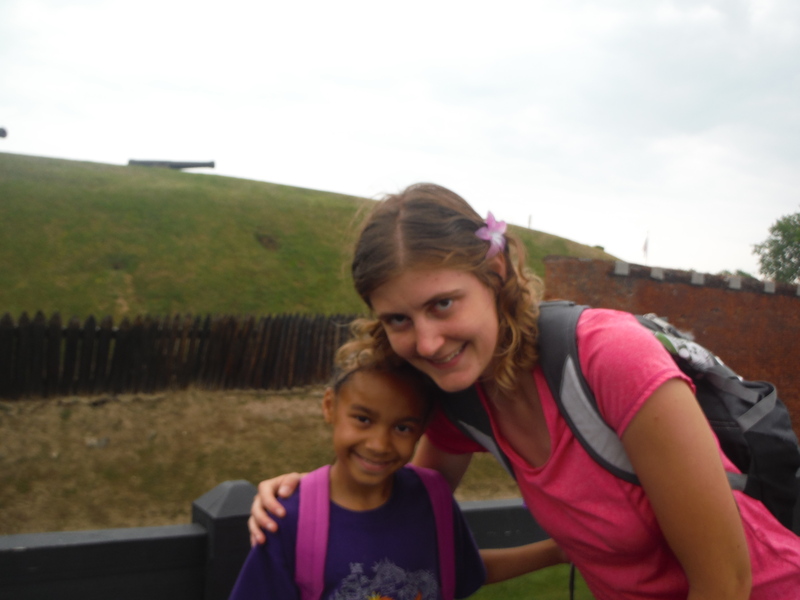 Daisy and I touring Fort Niagara. After all this volunteering in my travels (the buzzword for this is “voluntourism”), you’d think I would encourage everyone to go out and try to volunteer on all their travels, right? Well, sort of. I’ve learned a lot since my first trip to Peru, and I’m now more selective about how I voluntour. Before I volunteer afar, I volunteer near home. 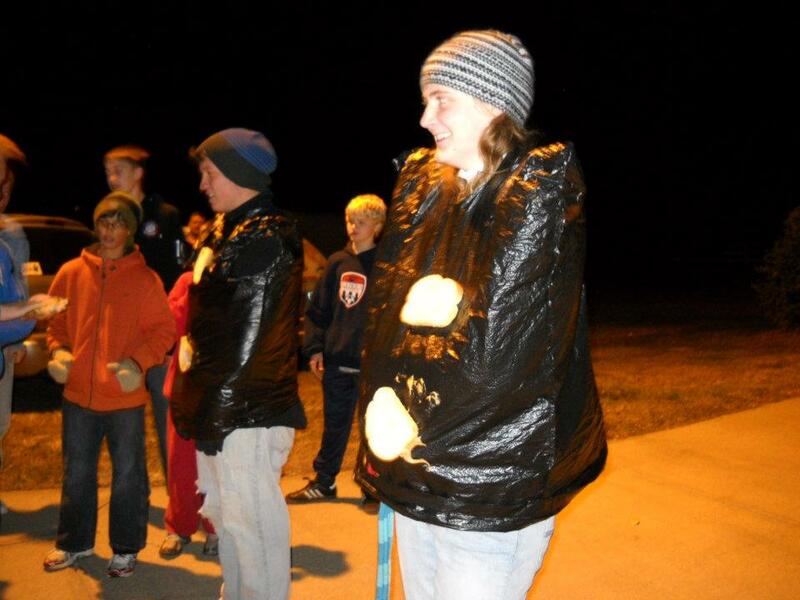 I taught a local youth group a game where they got to slap peanut butter bread on me! I think the most important rule is this: if you wouldn’t volunteer at home, you shouldn’t volunteer while you travel. Hapless volunteering is a terrible way to try to make your trip meaningful. If you want to volunteer while you travel, find a local charity to work with before your trip. This will help you gain experience and make sure you’re cut out for the job. Don’t want to help near your home? I hate to break this to you, but this indicates that you shouldn’t volunteer afar either. If you want to help your destination’s community, you can still make a difference by purchasing from family-owned shops, staying at local accommodations, or sending donations to worthy causes. You must be dedicated to give your time. Comparing heights with little Angela and her tutora. This is one of the local women who are hired to care for the orphans, thus forming a long-lasting and mutually effective relationship. I’ve also learned that just because an opportunity exists doesn’t mean I should go for it. In fact, this can potentially hurt their community! 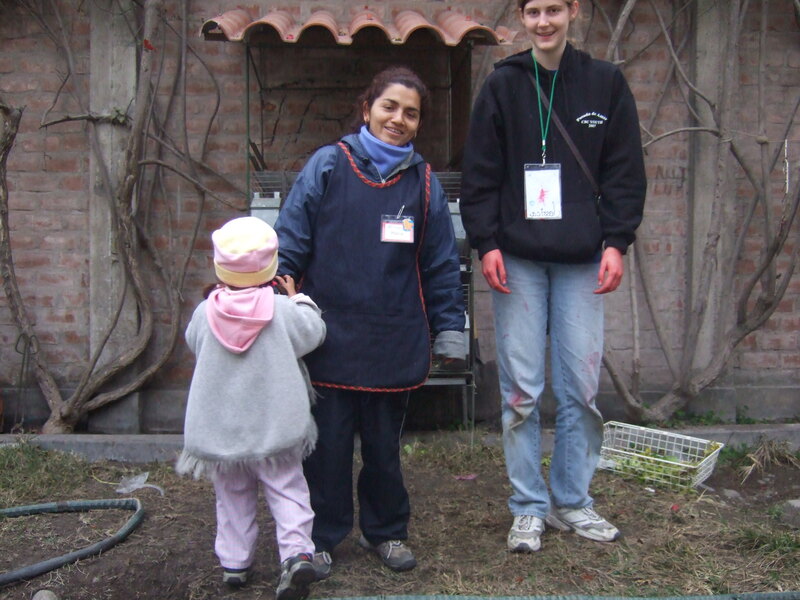 For example, our Peru trip leader told us that two of our tasks were to play with kids and do construction. The problem was, I never picked up a power tool before! I should have at least learned the basics before going. Better yet, the money spent on my plane ticket could pay local experienced construction workers to do the work. Then, instead of just helping the orphanage and school, we could help local impoverished workers as well! Now, while I’m no construction expert, I do know how to play with kids. But was that beneficial? The kids did have fun playing with us, but I know it hurt everyone emotionally when we left. Volunteering long-term, or at least keeping in touch through letters and frequent visits, would be a less harmful way to form relationships. Looking back, I think the one thing we did that was of real value was teach English. This is a sought-after skill in business, thus breaking the cycle of poverty. Since we were the only native English speakers in that area, we were best suited in this department. Contrast this to my recent voluntourism experiences. Before I went to Niagara Falls, I talked with the ministry director and offered to help in any way needed. (I also worded it so she wouldn’t feel obligated to place me if it was a hassle to get me involved.) She did what all charity leaders should do: asked questions! She wanted to know about my past volunteer experience, profession, church involvement, and even my hobbies! With that information, she could find the role where I would be most effective, which happened to be chaperoning a field trip. Same thing goes with my experience in Nashville. If I hadn’t spent several years writing for Devozine, I would have been more of a burden than a blessing. In addition, I didn’t waste money by making special volunteer trips. I’d already planned extended travel in these places, so I was able to maximize my buying power by staying in locally-owned small hostels, buying from local businesses, and spending time learning about the actual culture and needs of the area. Are you still interested in voluntouring? If you’ve read this far, I assume you are. The above wasn’t meant to scare people from voluntouring (because it CAN be a meaningful and helpful endeavor), but rather to just get people thinking about how they voluntour. I could continue to provide information on other things to think about, such as your ability and availability, safety limitations, legal requirements, and how to find worthy organizations to voluntour with, but all this information could fill a book! Instead, I’ll refer you to someone who already wrote a book! I learned a lot from Kirsty Henderson, a worldwide traveler who has volunteered in several countries. 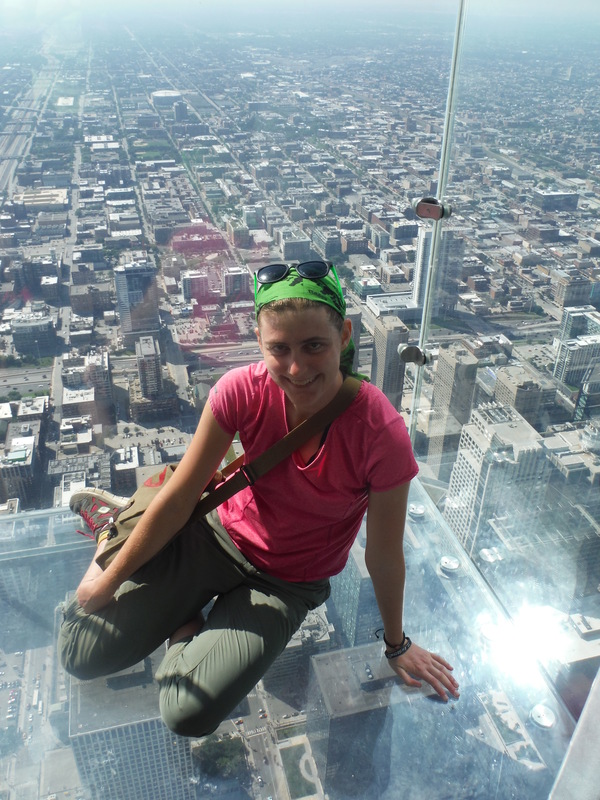 She wrote The Underground Guide to International Volunteering: For experiences that go beyond beaches and the backpacker trail. The eight chapters are filled with essential information, such as why you should (or should not!) pay a fee to volunteer, different types of volunteering, and a guide with a country-by-country breakdown of organizations you can help and what they provide their volunteers. I used this to discover a few opportunities that I’m looking forward to being a part of! I would like to thank Kirsty Henderson for providing me with a digital copy of The Underground Guide to International Volunteering: For experiences that go beyond beaches and the backpacker trail. And no, she didn’t pay me to say nice things about it- I just really like her book! I don’t believe that you have to be rich to travel. In fact, as long as you’re not in debt, there’s a trip out there that can fit your budget perfectly. Whether you’re headed around the world or simply to the next town over, here are a few ways you can get the most out of your travel experience- and still stick with your budget! 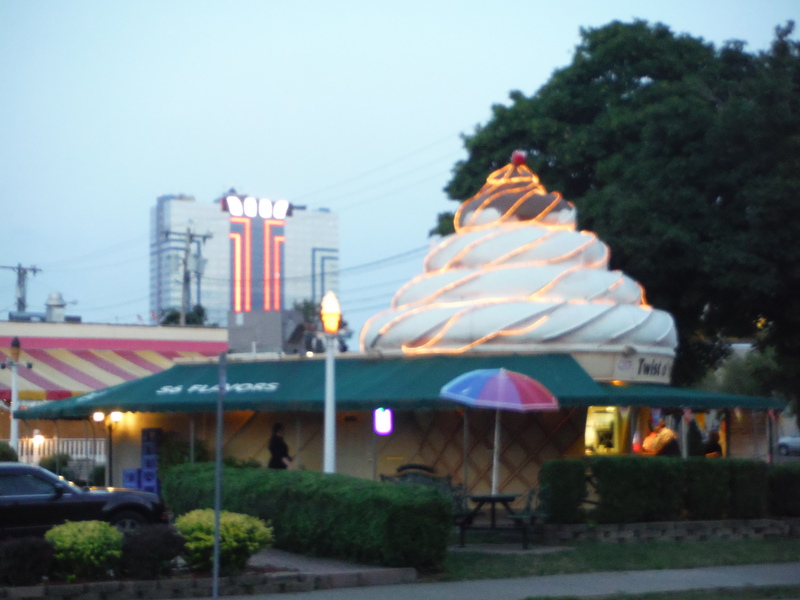 Twist O’ The Mist in Niagara Falls, NY has been one of my favorite ice cream shops! I’ve visited (and once even lived in) several towns with triple-digit populations. There isn’t much in these places, but there’s usually an ice cream shop. Ask for a scoop of the most unique flavor on the menu, and you’ll be reminded of your visit whenever you taste, smell, or even hear that flavor. If you’re visiting an area that has several options for ice cream, pick a place that serves flavors from a local creamery. Sure, a small cone at an ice cream stand may cost more than a whole tub at the grocery store, but these few dollars won’t break anyone’s budget. One of the best churches I’ve ever been to- The River in Delaware, Ohio is held in a converted barn! If you want to meet locals, experience culture, and look at unique art and architecture for free, then head to a church near your destination. Churches are found throughout the world, even in places where it’s illegal, so you’re likely to find several churches within a short radius. Because this is part of your travel experience, don’t be bound by denomination or feel like you have to agree with everything the church believes. I’ve used travel as a way to experience Methodist, Presbyterian, Southern Baptist, and Catholic churches for the first time. Some churches have a historic significance to the area they serve, and may even be open during non-service times for visitors to see what makes the building unique. Walking can bring many unexpected surprises, like this large, walk-able map of Tennessee in Nashville! Not only is walking free, but it can actually save you money if you use it in place of buses, taxis, or car rentals. You can experience a lot more of the area by walking. 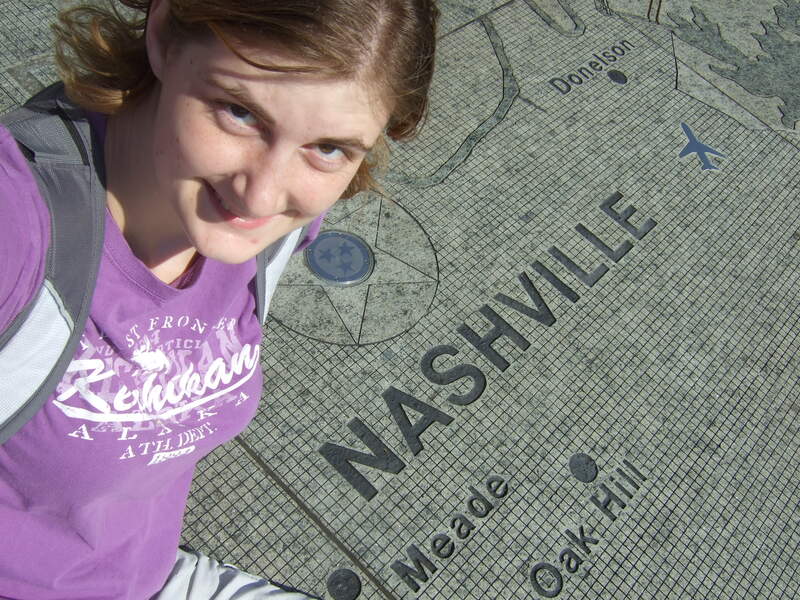 While I remember taking some long walks on family vacations, my first trip with extensive walking was in Nashville. It was there that I went to RCA Studio B, where Elvis first recorded. I didn’t intend to go there, it just happened to be one of the many fascinating places I ended up stopping at while on my way somewhere else. Besides, walking ensures that you can enjoy all that ice cream you’ll sample, guilt-free. 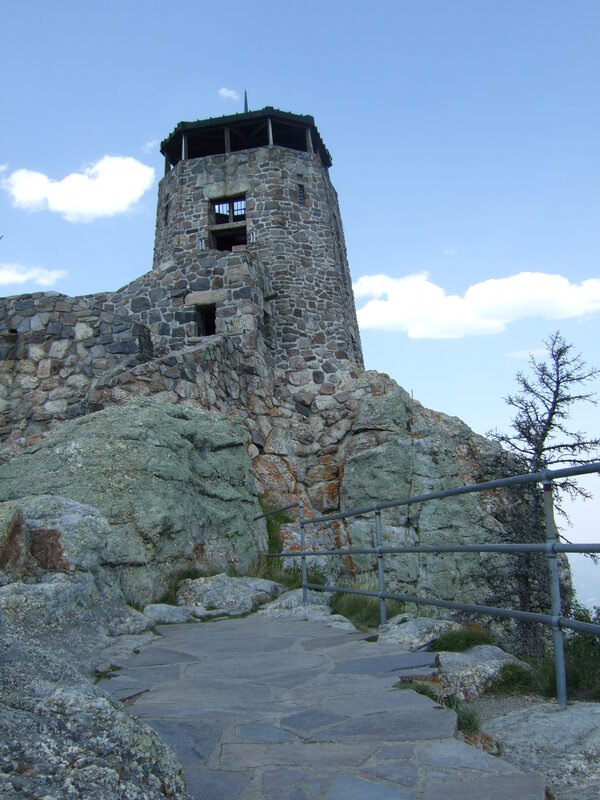 Some areas are not pedestrian-friendly, either because of a lack of sidewalks or because all the places you want to visit are a few miles apart from each other. In that case, I recommend seeing the area on two wheels. If you cannot bring your own bike to your destination, many hostels and other travel-related businesses can rent a bike to you (with a lock and sometimes a helmet) for a daily fee. Bicycles are the best of both worlds: you’ll be able to notice most of the unique things you would if you were walking, but you can also travel faster and for further distances. While staying at a hostel in Canada, I met a fellow traveler who came from Japan to ride a bike from Los Angeles to New York City, with lots of side-trips along the way. Imagine all that he must have seen! 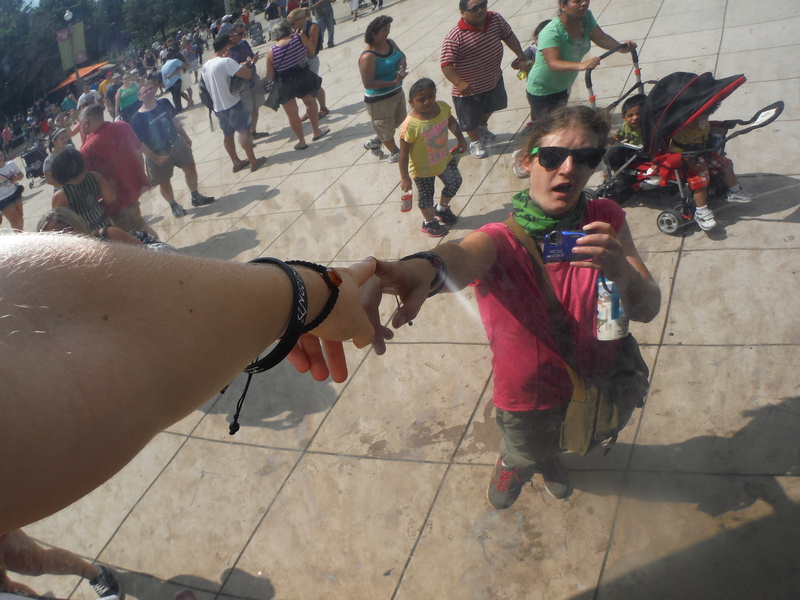 The best part of Chicago’s Cloudgate “Bean” is taking tacky mirror selfies to a whole new level! Getting a durable, quality camera may come with an upfront cost, but it is certainly worth all of the memories you’ll be able to capture. Naturally you’ll want to take pictures of the sights you see and the people you share it with, but you can also spend some time and actually get creative with the photograph. If you take a picture of a famous place, it will look the same as the millions of other photographs that other people took of the same place. However, can you incorporate your own unique flair? I once read a traveling shoe ambassador’s blog that put a face on a flip-flop and took pictures of it in several countries and states. If you take a fun spin with a photo, be sure to share it with me! 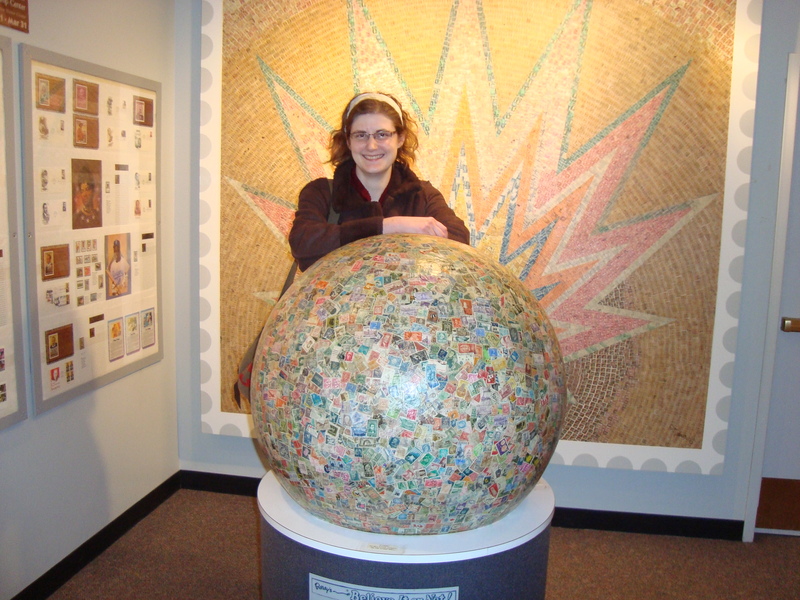 Touring Boys Town in the heart of Omaha, NE was a great experience made even better by seeing the World’s Largest Ball of Stamps! When traveling, you probably pick your destinations based on what you can see there. Of course you’ll want to visit what your destination is known for, but also keep an eye out for unique, little-known sites and attractions. People go to South Dakota’s Black Hills to see Mount Rushmore, but only a portion of these people stop at the wacky Wall-Drug on the way there. 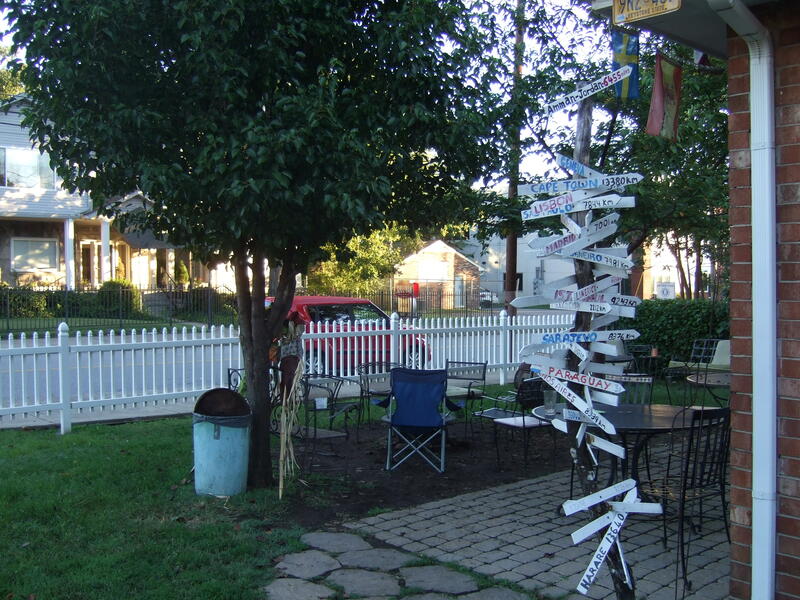 Find out about roadside stops that can enrich your travel experience at places like RoadsideAmerica.com. You can also follow road signs to any interesting-sounding attractions or, better still, ask the locals for their inside information. Two minutes before this picture was taken in Fremont, NE, I did not know this girl. 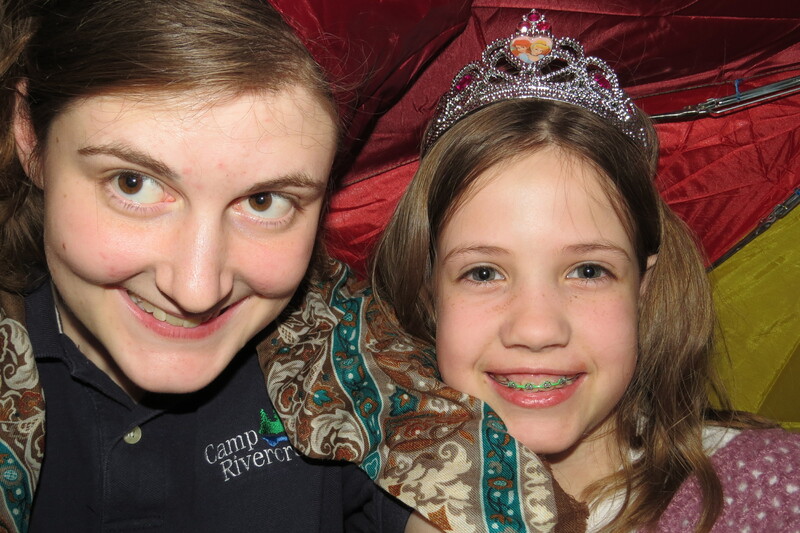 But she was bold an encouraged me to dress up for the retreat’s photo booth with her! Okay, I have to admit that I’m not naturally inclined to walk up to random strangers and start a conversation. But I do appreciate it when another (non-creepy) traveler comes up to me to talk. Being a native English speaker, I have had the privilege of helping people from all over the world practice their foreign language skills simply by chatting with them! While I had the luxury of speaking my own language, I have been able to hear all kinds of interesting first-person stories, and have also picked up a few tips for my travels. If you want to meet new people on your travels but aren’t very outgoing, try staying in hostels, riding the bus or train, or simply standing in a long line for a tourist attraction, and eventually someone will start talking to you! What are some ways that YOU make the most of your adventure while spending little money?